One fine evening I got a mail...Hey are you interested in baking? Would you love to join a baking group? The first thing that went through my mind was...No way..I won't get time to do this..Wont be able to post stuffs on time...I took a whole evening to think about it...Then finally decided..never have participated in anything properly...Never hosted an event and never been a part of any group...So finally replied my friend yes with a tons of questions.. and thus I am now for the first time a part of the group called Baking Partners:A Baking Group started by Swathi. 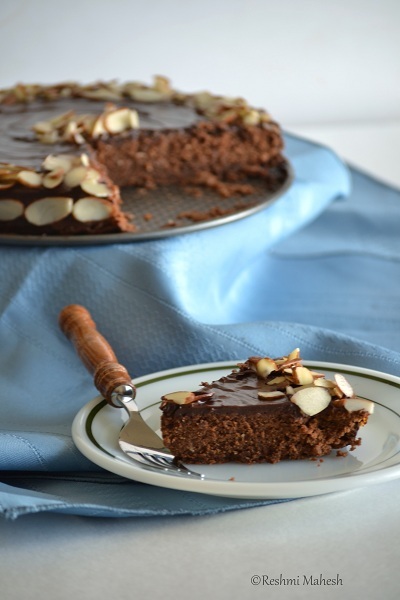 This is the first post made by the group which is a tribute to Julia Child on her 100th birthday.We baked Julia's Reine de Saba avec Glaçage au Chocolat which is Chocolate Almond Cake. **Substitute for cake flour: While measuring the cake flour, add 1 tablespoon of corn flour/corn starch and then fill the rest. 1. Preheat oven to 350F/ 180 C.Butter and flour the cake pan/ use a butter paper/parchment paper in the base of the cake. 2. Mix the chocolate and rum/coffee. Set the chocolate and rum or coffee in a small pan, cover, and place (off heat) in a larger pan of almost simmering water, let melt while you proceed with the recipe. 3. Measure out the rest of the ingredients. 4. Cream the butter and sugar together for several minutes until they form a pale yellow, fluffy mixture. Beat in the egg yolks until well blended. 5. Beat the egg whites and salt in a separate bowl until soft peaks are formed; sprinkle on the sugar and beat until stiff peaks are formed (make sure it should have peaks not deflate ones). 6. With a rubber spatula, blend the melted chocolate into the butter and sugar mixture, then stir in the ground almonds, and almond extract. Immediately stir in one-fourth ( ¼) of the beaten egg whites to lighten the batter. Delicately fold in a third (1/3rd) of the remaining whites and when partially blended, sift on one-third ( 1/3rd) of the flour and continue folding. Alternate rapidly with more egg whites and more flour until all egg whites and flour are incorporated. 7. Turn the batter into the cake pan, pushing the batter up to its rim with a rubber spatula. Bake in middle level of preheated oven for 25minutes. Cake is done when it has puffed, and 2 1/2 to 3 inches around the circumference are set so that a needle plunged into that area comes out clean; the centre should move slightly if the pan is shaken, and a needle comes out oily and gently set in center and tooth pick inserted into center comes out with a few moist crumbs attached, about 20-25minutes. Cool cake in pan 10 minutes. 8. Allow cake to cool in the pan for 10 minutes. Run a knife around the edge of the pan(if using flour and butter to dust pan), and reverse cake on the rack. Allow it to cool for an hour or two (about 2 hours); it must be thoroughly cold if it is to be iced. 9. 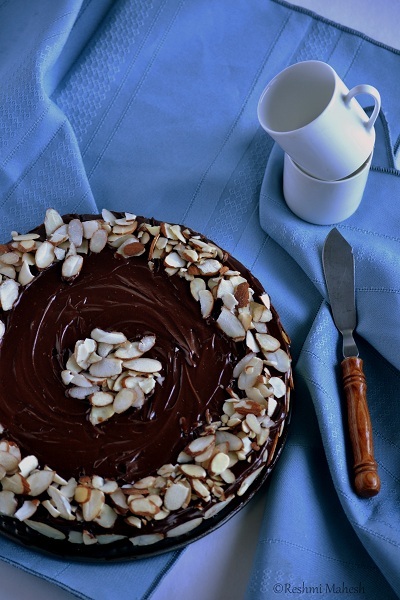 To serve, use the chocolate-butter icing recipe below, and then press a design of almonds over the icing. 1. A bowl filled with a tray of ice cubes and water to cover them and set aside. 2. Place the chocolate and rum or coffee in a small pan, cover, and set in a larger pan of almost simmering water. 3. Remove pans from heat and let chocolate melt for 5 minutes or so, until perfectly smooth. 4. Lift chocolate pan out of the hot water, and beat in the butter a tablespoon at a time. 5.Then beat over the ice and water until chocolate mixture has cooled to spreading consistency. At once spread it over your cake with spatula or knife. cake slice immediately after applying icing..
1.Use an 8 inch pan for the above measurements. 2. I used coffee extract(1 and 1/2 tbsp) in place of rum.You can use freshly brewed coffee. 4. 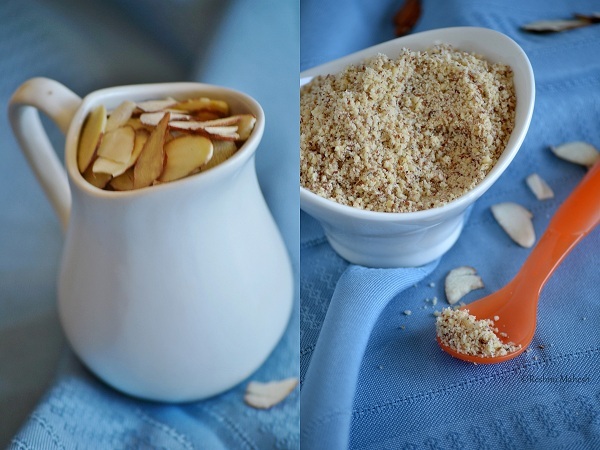 I used raw almonds and pulverized it.You can toast, blanch, pulverize the almonds. 5. Use good quality chocolates.I used ghirardelli semi sweet chocolates. 6. Cake took about 18-19 mins to bake for me,so keep a close watch on it. 7. The chocolate measurement here assumes that the chocolate squares are 1 ounce each.Before using check how much each chocolate square weighs. 8.Cake has a strong taste of chocolate and coffee.Basically a chocolate lovers cake. 9. I used APF and cornstarch instead of cake flour. 10. I used Almond flakes to decorate it. Cake slice the next day..Icing set properly. You nailed Julia's Reine de Saba avec Glaçage au Chocolat, Reshmi! Your cake looks perfect! Beautiful cake.. Loved all the clicks. Great Job, dear!! Perfect Almond Cake,well done! iam yet to post. I love chocolate. Sure this will be a treat for my taste buds..Looks delicious.. I LOVE your clicks. Beautiful! Your cake looks more moist and wet then mine. Great job! I can't pronounce this......but thi is beautiful!...I am def going to try this out soon! This cake is absolutely perfect. Looks delicious. Cake looks so beautiful and delicious..lovely!!! 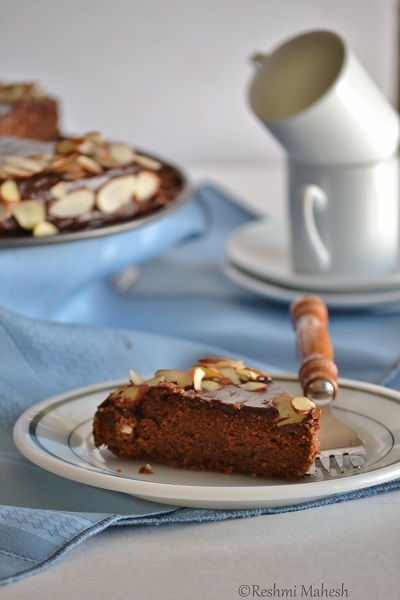 Awesome terrific Almond cake with such beautiful clicks to enjoy ! Cheers Reshmi! Cant take my eyes from ur irresistible clicks, prefect looking addictive cake. Rich looking cake, very good clicks Reshmi! 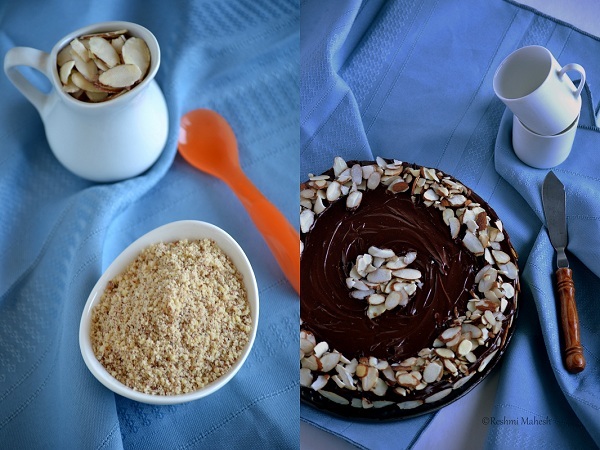 love this recipe Reshmi and your beautiful clicks are gorgeous. Wow..Reshmi, cake looks awesome dear! very perfectly made it. Nice clicks too. wow! what a perfect cake! Looks neat and yummy. Happy Independence day! Beautiful cake, You done very well. Great tribute to Master Chef Julia. The third Julia tribute I have seen today. Great work. Looks classic dear,especially adore the frosting and decoration.perfect texture dear. lovely presentation reshmi.. inviting clicks..
flawless! you have done julia proud! First time here. Love this cake recipe. 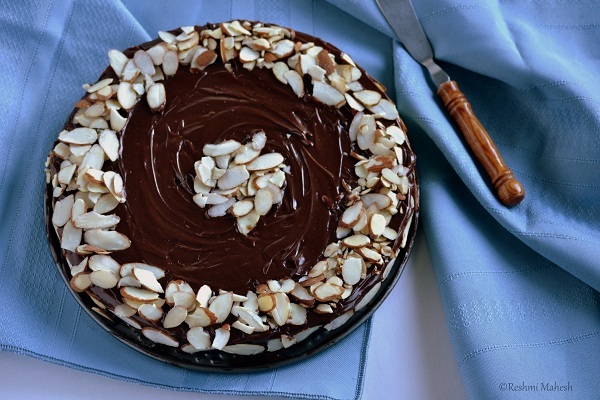 Almonds and chocolate is a winning combination. That cake looks so delicious. Beautiful presentation & awesome clicks. Do visit my blog to collect some awards :D.Congrats!! I cant take my eye off..That looks awesome Reshmi! Loved your addendum "Comments" section ~ an organized list of tricky steps the novice cook might find when baking with Julia Child! You answered all of my questions perfectly. Thank you, Reshmi. 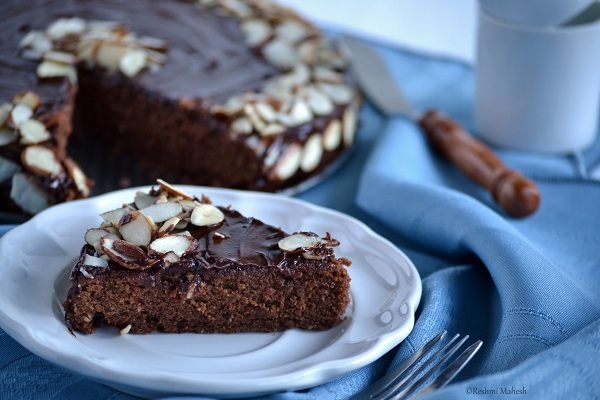 Your cake looks glossy and dark, with beautifully shaped almonds topping it off. Can't wait to follow your lead!